Everyday from 10:30 am to 3:00 pm. Plus $4 for combo (small drink and regular chips). Prime beef, melted cheese, aioli, salad and relish. Prime beef, avocado, aioli, salad and relish. Prime beef, blue cheese, aioli, salad and relish. Prime beef, aioli, salad and relish. Prime beef, beetroot, aioli, salad and relish. Prime beef, pineapple, aioli, salad and relish. Prime beef, chilli sauce, aioli, salad and relish. Chicken, avocado, aioli, salad and relish. Chicken, aioli, salad and relish. Chicken, satay sauce, aioli, salad and relish. Chicken, beetroot, aioli, salad and relish. Falafel, aioli, salad and relish. 1 Drum, 1 thigh and chips. 2 Drums, 1 thigh and chips. 2 Drum, 1 thigh and chips. 5 Drum, 4 thighs and chips. Tomato base, cheese, fresh tomatoes, onions, olives, mushrooms, roasted capsicum, spinach and oregano. Tomato base, cheese, lamb, pineapple, oregano. Tomato base, cheese, fresh tomatoes, oregano. Tomato base, cheese, chicken, onions, olives, mushrooms, roasted capsicum, oregano. Tomato base, cheese, beef pepperoni, onions, olives, mushrooms, roasted capsicum, oregano. Tomato base, cheese, chicken, lamb, beef pepperoni, onions, olives, mushrooms, roasted capsicum, oregano. 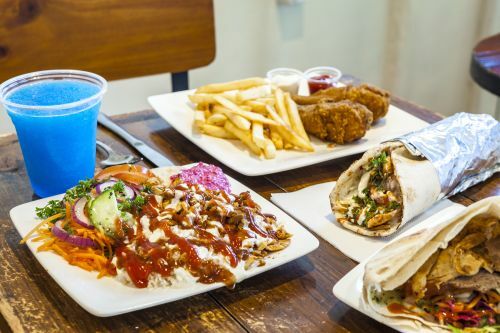 Your choice of fresh meat and salads topped with any two sauces in a warm pita bread. Your choice of fresh meat on fries with any two sauces in a takeaway box. Your choice of fresh meat and salads topped with any combination of two sauces served with fries. Your choice of fresh meat and salads topped with any two sauces served on rice. Your choice of fresh meats with any two sauces. Your choice of fresh meat and salads topped with any combination of two sauces. Egg, prime beef, avo, aioli, fancy lettuce, tomato, grilled, onions and tom reslish.